I've oven-fried pork chops and chicken breasts before, but the seasonings and butter come together in this recipe for a dazzling taste that pleases adults and children alike. 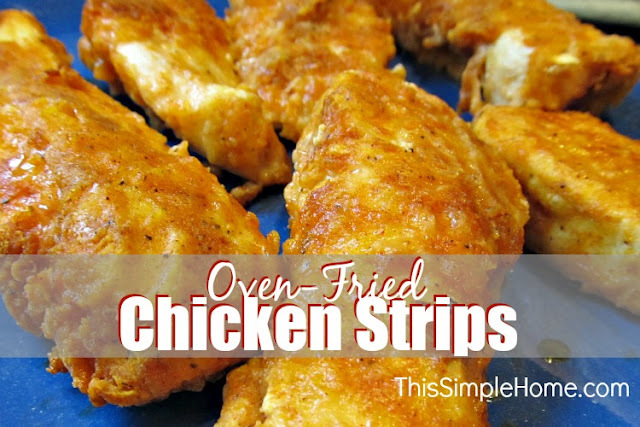 The first time I made these oven-fried chicken strips my husband asked if I had fried them. I knew what he meant and explained they were fried in butter in the oven. Since then, I have changed the recipe a little. We all love it. My nine-year-old has even requested leftovers in her lunch at school. Get ready to pin this one and share it! 1. Place vinegar in a liquid measuring cup. Fill the measuring cup to the one-cup line with milk. Let sit for five minutes to make buttermilk. 2. Cut chicken breasts into 3 or 4 pieces each. Place in a large bowl and cover with the buttermilk. Chill for 30 minutes. 4. Melt butter in your baking dish in the preheating oven. When melted, cover the entire bottom of the pan with butter. 6. Shake extra buttermilk from chicken breast. Place in the bag and shake to cover in the flour mixture (or dip in the bowl). Place in the baking dish after butter has completely melted. 7. Bake for 40 minutes. Flip each breast after baking for 20 minutes. Enjoy! If you want to use 5 or 6 chicken breasts, I would recommend doubling the dry ingredients and dividing 1/2 cup of butter between two 9x13 pans. *If you have buttermilk handy, use buttermilk and skip the vinegar. I cook from my pantry, so I always make my own buttermilk. This chicken strip recipe is quite easy, though there are quite a few steps. I promise, it's worth it! This chicken recipe was inspired by this one. Have you signed up for my author newsletter yet? I hope you will! Please sign up here. Oh this does look yummy,pinning it to give it a try. Yum! Looks delicious Annette, sounds like an easy one to recreate, thank you for sharing your recipe. Cheers!